MARCIA BURTT is a founding member of two groups that paint to celebrate and preserve the environment. Together they have raised about $1.5 for these causes. Over the years Burtt has been invited by the Forbes family and American Artist magazine to participate in painting events at the Forbes ranch in Colorado, at Chateau de Balleroy in Normandy, and across the United States after the events of 9/11. Her work has frequently appeared in art publications, most recently the June, September, and October 2010 issues of American Artist. She was an instructor at Weekend With the Masters in 2010. Burtt’s paintings hang in many public collections including Cedars-Sinai Hospital in Los Angeles and M.D. Anderson Cancer Center in Houston. 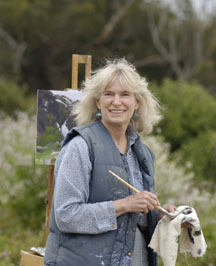 She lives on a 1200-acre cattle ranch on California’s Central Coast with her husband Dave.